Thunderbird Speedway Race to the Eggs! Movies at the Fish! - Free Friday! 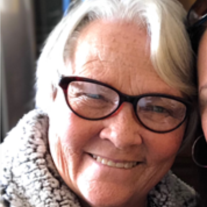 Patricia Ann (Scott) Boulter, 65, of Fort Gibson was born August 23,1953 in Fort Kilmer, NJ to Millard and Dorthy (Ross) Scott and peacefully passed away Friday, January 25, 2019 in Tahlequah, OK.
Patty grew up in Osceola, AR. and received her formal education. She later moved to Fort Gibson, where her children were raised. Patty’s life centered around her kids, grandkids, and family. Her passion in life was her family where she took the title of homemaker seriously. Her last few years found her working with the Fort Gibson Public Schools as a substitute teacher where she was loved by her peers and the children. She will be truly missed by all. Patty is preceded in death by her daughter, Brooke Renee’ Boulter and her father, Millard Scott. Those left to cherish her memory are her mother, Dorthy Scott (Mimi) of Brookland, AR; sister, Brenda Phillips and brother in law, Barry of Jonesboro, AR; son, Matthew Scott Boulter and wife Brandie of Fort Gibson, OK; daughters, BreeAnn Rice of Broken Arrow, OK and Brittany Flowers and husband Chadd of Concord, NC; grandchildren, Corbin and Savannah Flowers of Concord, NC; Brett and Bailey Boulter of Fort Gibson, OK; Braden and Jaxon Rice of Broken Arrow, OK; extended family and many friends. Viewing will be 11:45AM-12:15PM Tuesday, January 29, 2019 at the Fort Gibson Church of Christ. Funeral services celebrating Patty’s life will be 12:30PM Tuesday, January 29, 2019 at the Fort Gibson Church of Christ with Elder Budo Perry and Minister Dan Rouse officiating. Committal prayers and interment will follow in Citizens Cemetery in Fort Gibson with nephews; Brent Phillips, Hunter Phillips, Eric Hadley and friends; Jim Huggins, Steve Clinkenbeard and Greg West serving as casket bearers. The daughter, Brittany of Patricia Ann (Scott) Boulter has entrusted her care, services and burial to Clifford D Garrett Family Funeral Home, Fort Gibson. 918-478-2555.